A spinal compression fracture may result from weakening of the vertebrae in a spinal segment. This is usually related to osteoporosis but may also be linked to an injury. Compression fractures typically occur in the mid-back, or the thoracic spinal segment. This area includes T1 through T12 vertebrae. It is not uncommon for a spinal compression fracture to occur in the lumbar spine. If this type of back injury occurs, your doctor may recommend kyphoplasty. Kyphoplasty is a type of vertebroplasty. Both are minimally invasive techniques that stabilize the fractured bone using medical cement-like material. In vertebroplasty, the material is injected directly into the fracture. Kyphoplasty includes decompression using a small balloon to restore both height and stability to the fractured vertebral space. Who is a candidate for kyphoplasty? Many patients who have developed pain or spinal deformity due to a compression fracture are good candidates for kyphoplasty. Results may be best when the procedure is performed within 8 weeks of the fracture. Patients reported immediate improvement in comfort level and range of motion. Reported pain level continued to decline, reaching a level of 2.4 at 12 months (dropped from 8.7 on a scale of 1 to 10 before surgery). Back function on the Oswestry Disability Index (ODI) scale improved 59% within 12 months. Based on the Short Form Health Survey, patients reported significant improvement in quality of life. Kyphoplasty resulted in an 88% reduction in bed rest due to back pain. How do I prepare for kyphoplasty? If your doctor recommends that you have kyphoplasty, one of the best things you can do to prepare is ask questions. We encourage patients to write down any questions that arise. An informed patient is a prepared patient. Before the procedure, your doctor will review your medical history and discuss any medications you are taking, including supplements. It may be necessary to modify the schedule or dosage of certain medications before the day of the procedure. Kyphoplasty is a minimally-invasive procedure with minimal downtime for recovery. However, it is beneficial to prepare the body for healing by consuming healthy foods and getting plenty of rest and water in the days leading up to treatment. “Dr. Trujillo and PA Hall are also very professional, friendly, and kind. They explain things in a way anyone can understand without it sounding condescending. They have a fantastic bedside manner. They also both seem genuinely interested in whatever you have to say, and clearly care about their patients. They are very receptive to doing whatever they possibly can to improve your quality of life.” – Lindsay A. Before the procedure, imaging may be performed to confirm the location of the fracture or fractures. Kyphoplasty is performed with IV sedation or general anesthesia. X-ray imaging guides the insertion of a small needle. This needle is progressed to the bone where the fracture has occurred, and the balloon at the end of it is inflated. This raises the vertebra to its normal height. 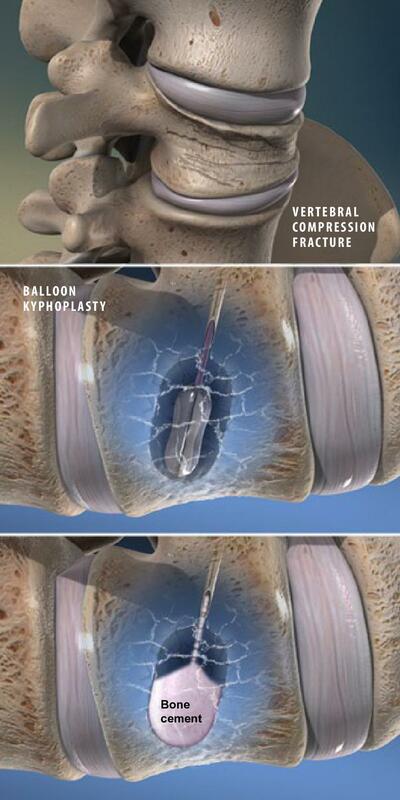 While the balloon is inflated, the cement-like material is injected into the fracture. This cement fills the cavity, hardens inside the vertebral body, stabilizing the fracture. The placement of cement is confirmed and the balloon is deflated and removed. When the procedure is complete, the needle is removed. The opening in your skin is closed. Your doctor will give you instructions to aid your recovery. Many patients who undergo kyphoplasty report an immediate improvement in their comfort level. Normal activities can be resumed within a day or two with the exception of heavy lifting or strenuous physical exertion. Patients should not drive until cleared by their doctor to do so. Exercise and heavy lifting should be avoided for six weeks. While comfort is generally improved after kyphoplasty, minor tenderness or soreness related to the injection can usually be well-managed with over-the-counter pain medication. Speak with Dr. Trujillo or a member of our staff if you have questions about how to manage potential post-treatment pain. What are the risks of vetebroplasty? During our initial consultation and treatment planning visit, Dr. Trujillo will discuss the risks of kyphoplasty as they relate to your particular medical history. At Summit Healthcare Pain Clinic Associates, it is our intent to help patients in the White Mountains area improve their quality of life through proven, evidence-based pain management strategies. To learn more about kyphoplasty, schedule a consultation with us. Call 928-532-1605. Our practice serves Show Low, AZ and surrounding areas.